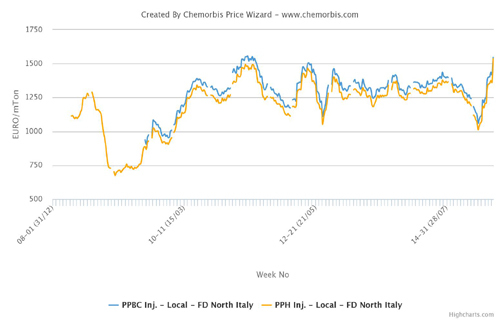 In Europe, PP prices are currently indicating €40-60/ton hikes from May levels supported by persistent supply tightness and firm upstream chain, according to ChemOrbis. Initial June offers had emerged with increases of €50-70/ton, but buyers’ resistance to higher levels forced distributors to make corrections on their prices on the upper ends of the overall ranges. Currently, the high ends of the distribution market represent a step back of €30/ton both for homo PP and PPBC inj. from last week when spot prices hit the highest levels since 2008 on euro terms following initial hike announcements. Nonetheless, offers continue to be above May levels. 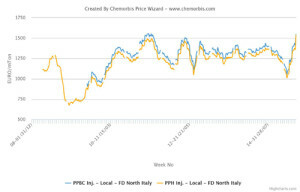 The region faces tight PP availability given offline capacities and force majeure declarations while sellers also blame higher June propylene contracts for their firmer pricing policy. Looking at spot propylene costs, they were down by around €10/ton to be reported at around €1060/ton FD NWE since June started. Buyers are not rushing to make new purchases this week, with some of them making price inquiries to their regular suppliers to learn their June allocation. Most buyers are planning to wait for a while before making new purchases in order to negotiate for some discounts on current prices, assuming that supply levels are improving. “We have some inventories on hand that will last for a while and we are not planning purchases for this month,” some converters reported. A packager in Germany reported, “Our regular suppliers started June with €100/ton hike announcements before moderating their hike targets to €80/ton.” He further stated that supply for PP copolymer is more comfortable than for homo PP while he is only willing to pay the propylene contract increase. June propylene contracts settled up €40/ton at €1030/ton FD NWE compared to May.